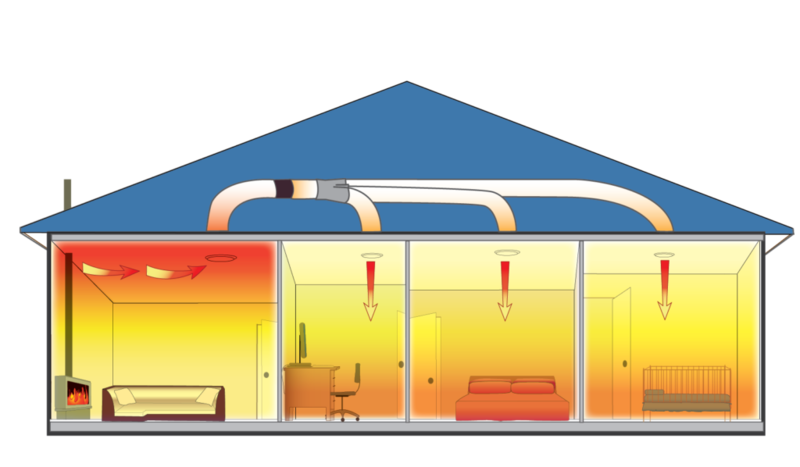 HeatTrans heat transfer systems, make use of excess heat by transferring it from one room and distributing it to other rooms in your home. Now 3-Room with Heat Retention Plus option using R1.0 thermal and acoustic insulated ducting from fan. Now up to 67% of heat can be retained and delivered to other rooms in the home with the ducting acoustics effectively dampening airflow noise. Add a Summer-Vent extension kit now and use your HeatTrans heat transfer system to bring in outside air during the warmer months. If your lounge is warm & comfortable but the rest of the house remains chilly, then this is the heat transfer system you need! By transferring the excess heat, you can efficiently use that warmth to reduce the chill in bedrooms; creating a drier, more comfortable home. Add a Summer-Vent Extension kit now to draw outside air via an inlet grille in the soffit, through the high efficiency F7 filter and circulate the fresher air around the home. Summer-Vent uses the existing HeatTrans heat transfer ducting/outlets. The Pro-Series Additional Outlet Kit is designed to extend the 3 room Heat Trans heat transfer system so you can distribute warm air to four rooms. By adding additional outlet/s to your system you are able to divide the available heated air amongst more rooms. Unique acoustic insulated duct in HeatTrans heat transfer systems reduces airflow noise to a ‘whisper quiet’ level. Better temperature heat retention is achieved also, during heat transfer. HeatTrans gives the ultimate control in heat transfer systems. The high quality automated touch screen controls when the heat transfer system operates to maintain your pre-set comfort level in your lounge. The diffusers within your home are easily adjustable to allow balancing of the airflow into each room. Simply twist the centre section of the diffuser to allow more or less air into each room. Or if your diffuser is located in a guest bedroom you can simply close that diffuser completely when the room is not in use. HeatTrans is the trusted brand in heat transfer systems. HeatTrans has been leading the market for over 15 years and is at the forefront of product development and innovation with features like the acoustic duct and digital controllers. HeatTrans heat transfer systems are available from leading Electrical Wholesalers & Hardware Retailers. Proudly distributed by Simx Ltd. Click the Find a Stockist button to use the Simx locator page. The only heat transfer system on the market to include acoustic insulated ducting, HeatTrans achieves maximum heat retention with minimum air transfer noise. Heat Trans systems re-utilise your excess heat by transferring it from one room and distributing it to other rooms in your home.